There is no occupancy requirement for HAFA and no limit on the number of properties that can be approved for HAFA. Previously, HAFA required homeowners to have lived in the property within the last 12 months. If the property is a rental property occupied by a tenant or non-borrower occupant, the $3,000 HAFA Relocation assistance must be paid to the tenant or non-borrower occupant and must be reflected on the HUD. Mortgage payments will be allowed to exceed 31% of the homeowner’s gross monthly income. Additionally, a borrower who is at risk of imminent default and at least 15 days delinquent can be considered. 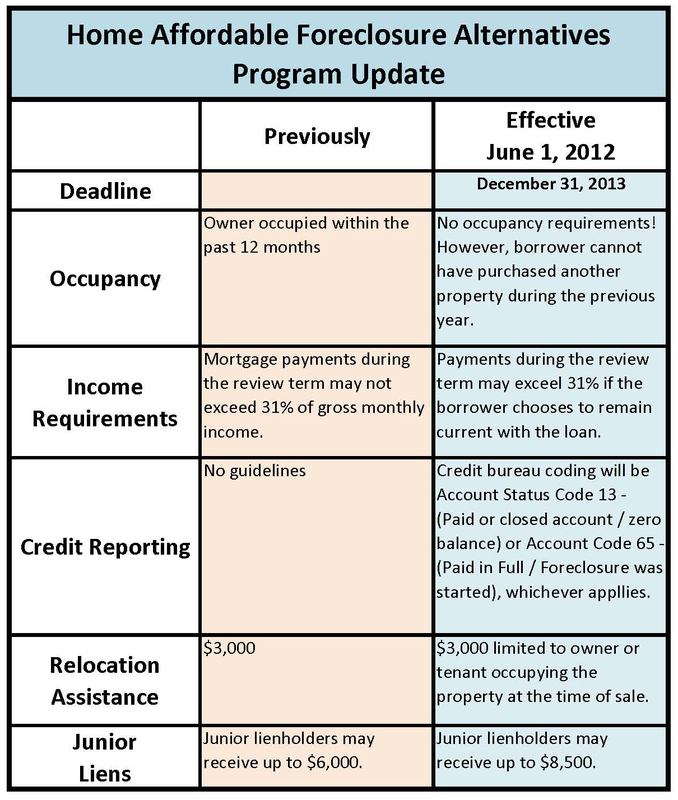 This update will allow a homeowner to stay current on the mortgage and still qualify, minimizing the overall impact to credit. Secondary lien holders may receive up to a maximum of $8,500, (up from $6,000 previously). The Credit Bureau Reporting will be Account Status Code 13 (paid or closed account/zero balance) or 65 (account paid in full/a foreclosure was started), as applicable. The following chart gives the guidelines for the HAFA Program. You can see that it is making option to short sell more attractive for anyone with an underwater home in Las Vegas. We are seeing Short Sales make up more and more of the total real estate sales in Las Vegas each month as well. These changes will allow underwater investment property owners a chance to avoid foreclosure and it willallow owner occupied home owners the option of a short sale without having such a devastating effect on their credit rating. May I imply just saay what a comfort to uncover someboy that truly knows what they are discussing online. You certainly know how too brimg a problem to light aand make itt important. of youhr story. I wwas surlrised that yyou aren’t moire popular since yyou most certainly have tthe gift.